Code Pink supporters celebrate the one year anniversary of their protest against the marine recruitment center. Daily Cal reporters Anna Widdowson and Liz Chang discuss the current state of the recruitment center. Despite enduring more than a year of turbulent protests, officials from the Marine Corps recruiting center in Downtown Berkeley say their program has been running smoothly. Protests have continued almost daily since September 26, 2007, when a small group of Code Pink activists assembled outside the recruiting office on Shattuck Avenue for an anti-war rally. Since then, there have been multiple arrests, and the protests have attracted national attention. 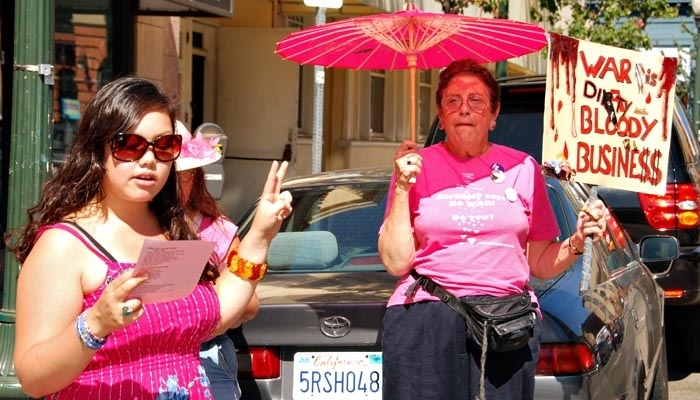 "We demonstrate there every day, sometimes more than once a day," said longtime Code Pink activist Zanne Joi, who drives the Code Pink truck decorated with anti-war banners that is often parked in front of the Berkeley office. Despite some rumors to the contrary, the Marines have no plan to close the center, said Lt. Jill Leyden, a Marine spokesperson. "The Berkeley office is open for business," she said "And it's definitely not closing." The controversy over the center escalated in January when the Berkeley City Council passed a set of motions that sanctioned the protesters' presence and incited anger by calling the recruiters "unwelcome intruders." A month later, as 2,000 people protested outside of the City Council chambers, the council retracted the statement, but declined to apologize for their comments. Marine Sgt. Matt Deboard, the marketing and public affairs director at the San Francisco Recruiting Station, said that the protests have not deterred recruiting at the Berkeley office. "In fact, they have done the exact opposite, he said. "We've had lots of people come into the office to express their support for what we're doing." Deboard said he could not disclose the exact number of people that the center recruits, but added that the office continues to fill its monthly quota. "We are doing really well," Deboard said. "We have been making (our recruitment goal) every month." The Berkeley office has a lower quota than most offices across the country because it only recruits marine officers, who require a college degree to serve. According to Deboard, the Berkeley office does not employ what some call controversial tactics, which have attracted media attention in the past, to recruit enlisted Marines. "We are not cornering people in malls or anything," Deboard said. "We do job fairs and things like that because we have to be more selective." But Leyden said the Berkeley office has attracted more attention than any other recruiting center in the country because of the near constant protests. Deboard said that the office has not taken a position on the protesters and has avoided confrontation despite the sometimes constant noise outside the office. "The protesters are first and foremost American citizens with a voice," he said. "We are not in a reactive position, and we don't resent them or anything like that." Even though the Marine recruiting center has not yet left Berkeley, Code Pink members said they feel like they have continued to make progress by making potential recruits aware of the costs of war. "We have an uphill battle right now," Joi said. "But we want to make it clear that we are protesting sending our youth into this continuing war."